“I grew up wanting to be a baker, but when I realized I’d have to wake up at 3am. to bake scones every day, my love for food turned into wanting to make sure everyone has access to it,” Davidson said. 25% of participants reported food insecurity within the past year, with first generation students and students receiving financial aid having a greater risk of food insecurity. When she began the research back in 2014, there was no national data on food security among college students, and only three peer-reviewed articles published on the topic. In order to address these gaps, Davidson’s study utilized an online questionnaire that combined the US Department of Agriculture 6-Item Short Form US Household Food Security Survey with demographic and food assistance use questions, to examine food insecurity and its associated factors among students at UNH. Findings revealed that 25% of participants reported food insecurity within the past year, with first generation students and students receiving financial aid having a greater risk of food insecurity. Additionally, 11.6% of students reported being hungry but not eating because there was not enough money for food. 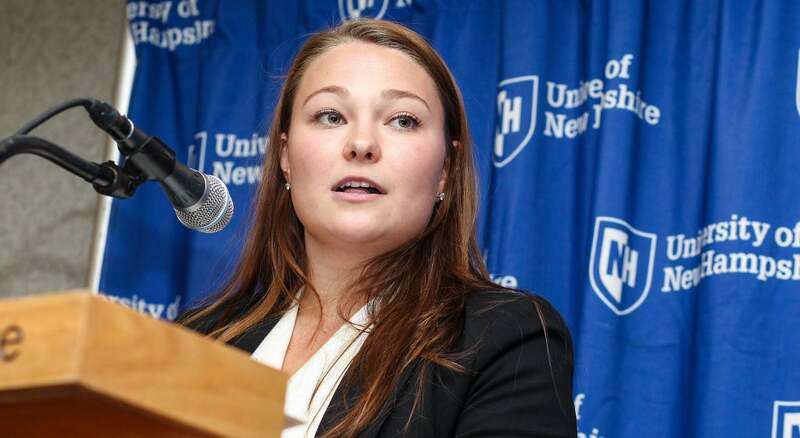 Davidson emphasized one primary takeaway from the research; “food insecurity is a problem for students at UNH and college students across the country, that’s unacceptable.” She also noted that the study found a large number of students (42.4%) who did not know if they qualified for Supplemental Nutrition Assistance Program (SNAP) benefits. Shifting the conversation from problems to solutions, Davidson highlighted the need for education and awareness of food resources on college campuses such as local food pantries, SNAP eligibility, and meal donation programs like Swipe it Forward. After four years and countless presentations at research conferences, Davidson’s final article was published in the Journal of Hunger and Environmental Nutrition. She began her yearlong search to find the right outlet by reviewing both the focus and the impact value of each Journal. Once she found the right fit, her article was accepted without revisions and released within a few months. Despite this long process, “I wanted to make sure I got published to help build a national database of research on college student food insecurity,” she said. Davidson became extremely motivated by her research on food insecurity to further her education on food policy and advocacy. When the time came to apply to grad school, “I only applied to Friedman and one other school. I knew Friedman was the best place to further my education in nutrition and policy,” she said. Now a second year student in the Food and Nutrition Policy and Programs, program, Davidson has gotten involved on-campus as a founding member of the Friedman Food Policy Action Council; a student group working to advance evidence-based nutrition and agricultural policies in support of public and environmental health. She also pursued a summer internship with the Massachusetts Department of Transitional Assistance; where she now is employed part-time with the SNAP outreach and policy units, working on special initiatives to increase SNAP access to college students and veterans. Are you a student or member of a student organization doing great work in nutrition science and policy? We want to feature you. Contact nutritionnews@tufts.edu to let Friedman communications know what you’re up to.